You will need to Re-Level Mobile Home Floors from time to time because the ground becomes soft during the rainy season and the soft unstable ground under your mobile home allows the blocks to sink and move. Many times the reason is your mobile or manufactured home was not leveled correctly when it was set up. Make sure the mobile home installers used concrete or hardwood to level your mobile home and they used the correct number of blocks to ensure your home is stable. Mobile homes that were leveled correctly will still need to be re-leveled at some point in the life of the mobile home. Be glad we we don’t have frost freeze cycles and expansive soils like many of the northern states which makes the have to constantly Re-Level Mobile Home Floors. Mobile homes and Manufactured Homes are built on a steel frame. They are transported to the lot where the mobile home must be set-up. Before the actual tie down of the mobile home it’s leveled with hydraulic jacks, and then concrete blocks or steel piers placed under the steel frame to keep i. The wheels are usually removed as it is set on concrete blocks or steel piers in the dirt. Because the mobile home is sitting on the ground they will always settle as time goes by. All Mobile Homes and Manufactured Homes need to be Re-leveled from time to time. 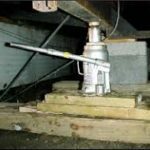 Mobile homes are lifted and leveled with hydraulic jack systems like the ones used to level the home when it was set up. Your mobile homes supports or piers will need to be tightened or adjusted every 3-5 years. Doors and windows in your home will begin to stick and will be hard to open, or may not shut at all. Floors that are out of level are a sure sign that you have problems. They’ll also make noise when you walk on the soft areas. Countertops out of level in your kitchen and bathroom are a good indicator of a mobile home that’s out of level. Exterior decorative block and skirting that has buckled outside your mobile home is another sign of settling problems. Call us anytime at (800) 986-3231 for a free examination of your mobile home. This is because of the equipment needed to raise and lower the mobile home without causing further damage. Florida Anchor and Barrier has all the right equipment like this heavy duty mobile home jack and we’re licensed and insured to do this work. 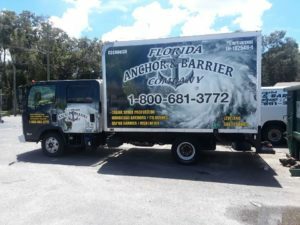 Florida Anchor & Barrier has offices all over the State of Florida.